The rate at which infinix mobile keeps bringing in new models into the Android market is alarming and I am certain they are already giving Samsung and Apple a run for their money. 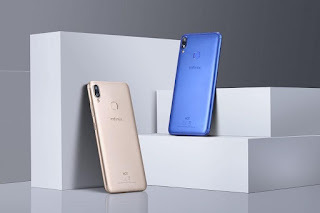 Not too long ago Infinix released the Infinix hot 6X and here we are now with an upgrade to it, the Infinix Hot 6X Pro. The infinix hot 6x pro comes as an upgrade version of the infinix hot 6x. Some notable upgrade/features packed in the hot 6x pro is the extended internal memory space and of course the Artificial intelligence powered back camera. This review will reveal lots of other specifications of this device, so sit tight. The infinix hot 6x pro comes with a plastic sleeky body. The device is handy so its dimensions are 156.7 x 75.3 x 8.3 mm and it weighs 150 grams which isn't too heavy. Rumours in the mobile space says the device comes in gold, black, red, and blue colors. Now let me break your heart, the device isn't water resistant. Yeah, i felt bad too. But good news is the Display type is HD+ IPS LCD capacitive touch screen. The screen size is 6.2 inches of 16 million colors. Furthermore, the pixel density is 267 ppi, screen to body ration is 87 percent, and aspect ratio is 19:9. Protection features include multi-touch, scratch resistant, Dragontrail glass, and 2.5D curved glass. The infinix hot 6x pro comes with a dual rear camera setup of 13 MP and 2 MP shooters that come with Quad-LED flash, f/2.0 aperture and other features, not bad right? These features include FHD recording, auto focus, continuous shooting, digital zoom, facial recognition, geotagging, panorama, scene mode, self-timer, HDR, and more. The advanced feature here is AI portrait. Now the selfie camera I was so eager to see kinda failed to impress me.The front camera also known as selfie camera is 8 MP but there is no front flash, although there is f/2.0 aperture in the secondary camera. The Infinix hot 6x pro rocks an Android 8.1 oreo and an Xos 3.3 user interface coupled to an hardware component which include Qualcomm Snapdragon 425 MSM8917 chipset with process technology 28 nm. Furthermore, CPU is Quad-core 1.4 GHz 4-Cores, while GPU is 2-Cores. These work with 64-bit architecture. I am not quite impressed the infinix hot 6x pro comes with a 3GB RAM, though not bad but a device like this should rock a 4GB RAM. With an internal storage of 32GB that's expandable to 128GB with an external memory card you are good to go if you are fan of large files. Sensors included in the device are Fingerprint, (situated to the rear) accelerometer, proximity, ambient light, compass, and gyroscope. There is combination of 2G, 3G, and 4G internet connectivity technology in the Infinix Hot 6X Pro. It means the device can deal with GSM, WCDMA, HSDPA, and LTE. These work with dual Nano SIM cards that are placed in two slots inside the device. Other connectivity components are Bluetooth, Wi-Fi, hotspot, USB Type-C, GPS, A-GPS, GLONASS, 3.5mm audio jack, and more. Powering the device is a Li-Po 4000 mAh non-removable battery which does not have wireless or fast charging capacities. However, the battery is powerful enough to give the user 48 hours backup after a 100 percent charging.